First, are you shopping for Obamacare insurance? If you are...keep going! It is very unlikely (no, not impossible) that any significant changes will occur for the 2017 coverage year. Open Enrollment is on right now, third party payors have filed plans with states that require those, and people are purchasing coverage even now. Enrollment ends 1/31, and, (as Jennifer points out), Trump will be sworn in on January 20th. All of this makes it very unlikely that any substantial changes will occur for 2017...again, not impossible, but unlikely to see big changes. (Remember when, like it or hate it, pundits were saying the same thing about the chance Trump would win?) 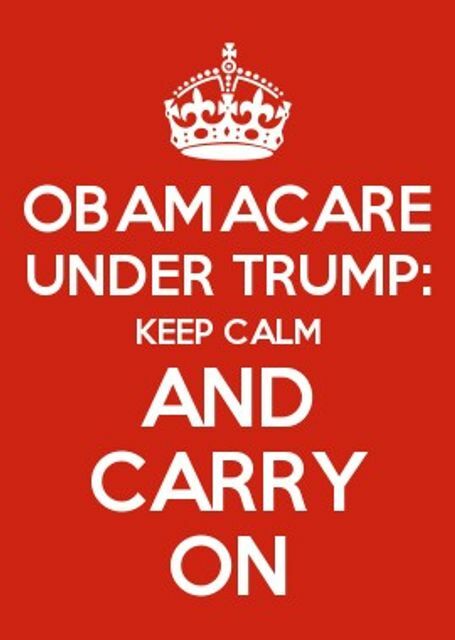 Recommendation: if you're in the process of shopping for and purchasing coverage, keep calm and carry on. Learn about the impact your health insurance has on your personal finances. If you have a minute, take a look at Ms. Fitzgerald's entire entry via the link below. If you do, you'll notice a staggering statistic: 96% of Americans can't define basic health insurance terms. If you're starting off confused already (and many clearly are), use some time to figure how any new coverage will fit with your budget...and how much it will cost based on your past healthcare usage along with any needs you think you'll have as you age. Make sure what you purchase now, and in the future, will truly have you covered. Under Obamacare, you can not be denied coverage for pre-existing conditions. Also, other elements like birth control coverage and child dental care are guaranteed to be included. One of the key potential changes that may come to Obamacare under the Trump administration includes a change to the mandatory inclusion of these (and other) elements in available plans. What does this mean for you? Recommendation: use this time to decide (perhaps even write down) exactly what you want and need in a potential plan. Consider leaving a note for your future self with your list of exactly what you want. Decide if elements that were previously mandated (like pediatric dental coverage) are right for you and make sure you highlight these somehow in your "note to self". In five months from now, when you look back at your note, we'll all know a lot more. For now, the headline is to carry on if you're purchasing, or considering a purchase, under Obamacare. Over the next several months, a note to self or similar reminder will help you be sure you understand your coverage, especially if mandated elements do change or are eliminated. The ACA comprises thousands of pages and far-reaching regulations...That will take time to unwind. Most experts and industry observers expect a transition period, so that insurance companies can adjust and consumers won’t have their protection yanked out from under them. It is highly unlikely that any material changes will happen for the 2017 coverage year (for which Open Enrollment is taking place now). Insurers have filed plans with state regulators for 2017, and are selling those now to Open Enrollees. Open Enrollment ends January 31; Trump will be sworn into office on January 20. It’s highly unlikely that the Trump administration could enact any material change to the millions of consumers who will have enrolled in and paid for 2017 plans. So if you’re shopping now for health insurance, carry on.